The Town & Country Center in downtown Palm Springs is considered one of the early examples of mixed-use architecture, combining commercial, retail, and residential accommodation. It has been suggested that Modernism Week wouldn’t have been possible if not for Palm Springs’ architectural preservation efforts. Next year’s annual celebration of our signature design will be the 12th such affair, and it will arrive in February having notched another notable success. Following a 10-year political tussle between Palm Springs preservationists and Wessman Development, owner of the Town & Country Center in downtown Palm Springs, the City Council voted 4-1 in April to grant what preservationists have wanted all along — a Class 1 Historic Site designation. Designed by two internationally renowned architects, Paul R. Williams and A. Quincy Jones, the Town & Country Center is considered one of the early examples of mixed-use architecture, combining commercial, retail, and residential accommodation. 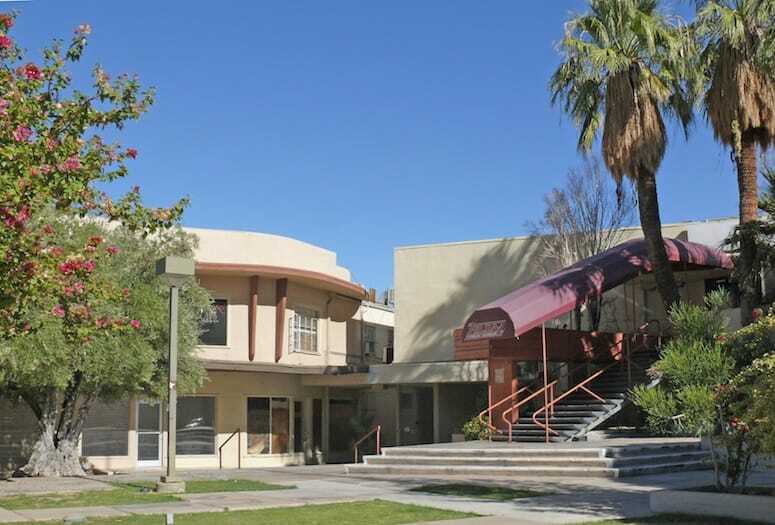 The Center, at 146-174 N. Palm Canyon Drive, is composed of several buildings constructed over several years (1946-1955). It straddles the space between Indian Canyon Drive and Palm Canyon Drive that once was an attractive courtyard. The Town & Country Center faces toward Indian Canyon Drive in downtown Palm Springs. With Class 1 cred, the T&C secures the city’s highest level of architectural protection. Palm Springs has more than 70 Class 1 properties, eight Class 2 (example: ones that are either demolished, something else built in its place, nonconforming and not restorable) and several thousand Class 3 designations (example: all 1,240 Alexander properties). The Town & Country Center’s journey to this important milestone was a rocky road. The Town & Country Center made the front of a Palm Springs post card. In 2006, the Palm Springs Modern Committee held a news conference in the courtyard of the T&C Center to raise community consciousness and to advocate for its preservation. In 2009, the Palm Springs Preservation Foundation (PSPF) submitted the center’s first Class 1 Historic nomination. The history and background of the complex was thoroughly researched by the late Patrick McGrew, a PSPF board member, who also wrote the original nomination document. In June 2009, the City Council voted unanimously to decline the Class 1 designation. The center had been incorporated by Wessman Development into the Museum Market Plaza Specific Plan, a city document that called for the demolition of the T&C Center to make way for an east-west road from Indian Canyon Drive to the Museum Market Plaza. A post card advertising the “Top of the Center” restaurant. Last year a nomination authored by Susan Secoy-Jensen, an architect and PSPF board adviser, was submitted to the California Historical Resources Commission for Town & Country Center’s eligibility in the state’s register of historic places and the National Register of Historic Places. In August 2015, the State Historical Resources Commission in Sacramento voted unanimously to make the T&C Center “eligible” for listing on both state and national registers. “The state’s enthusiastic endorsement of our submission on August 7, 2015, encouraged us to resubmit the local Class 1 Historic Site nomination to the City Council,” Marshall says. This morsel of Palm Springs’ architectural heritage might have disappeared without the efforts of a consortium of committed preservationists, including the Palm Springs Modern Committee, Palm Springs Preservation Foundation, the California Preservation Foundation, the Palm Springs Historical Society, as well as many individuals. For more than 10 years these advocates have maintained that the T&C Center once again could be a vital and handsome center for commerce and community. But throughout the long preservation battle, Wessman Development consistently opposed a Class 1 Historic Site designation. Now, not only does Wessman support Class 1 status, the company has retained one of the country’s foremost historic architectural restoration firms — Marmol Radziner. It’s the same outfit that so masterfully rehabilitated the Architecture and Design Center, Edwards Harris Pavilion, as well as the legendary Kaufmann House.